One of the elephant bulls that was darted and loaded onto a flatbed trailer. This method of lifting the animal is standard procedure and the animal was alive when the photo was taken. Photo supplied. The four elephants tragically did not survive the relocation efforts of a local NGO who had to relocate the animals using minimal resources. Four rogue elephant bulls that were causing havoc in the Gravelotte area in Limpopo last week died during a relocation attempt which took place on Saturday, reports Letaba Herald. Their deaths allegedly attributed to blatant bureaucratic inflexibility. The four bulls were traversing in the Gravelotte area for almost a week before the relocation attempt. In this time, they had caused significant damage to fences and farm infrastructure in the area. Many farmers local to the area had reached their wits’ end, and multiple farmers had threatened to shoot the animals. 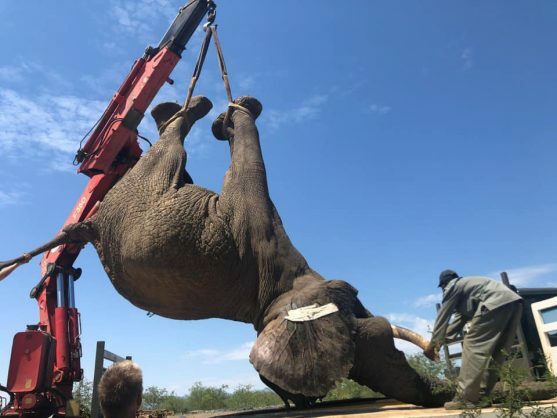 Moreover, the Limpopo department of economic development, environment and tourism (LEDET) were aware of the situation, and permits were already in place for the animals to be killed. On Wednesday last week, LEDET were already tracking the animals with the plan to dispatch them, the operation only being called off due to bad weather. Concerned local residents reached out to NGO Elephants, Rhinos & People (ERP) on Wednesday in order to try and intervene and find another solution to the issue. Local NGOs were also contacted, but no plans were put into action. When ERP found out three of the four bulls were of a large size, they realised their family-sized crate would not be large enough. Milburn said they then requested more time from LEDET, asking to start the process on Sunday with the aim to capture the animals on Monday, thus giving them time to source larger crates. According to Milburn, LEDET categorically refused and gave them until Friday to capture the animals, also stating that as of Friday, all responsibility for the animals would rest on ERP’s shoulders. This implied ERP would have to take full responsibility for any costs incurred from damages caused by the animals, or human deaths caused by the animals. Without the time extension, ERP were forced to make use of limited equipment, namely no crates. So instead, the elephants were to be transported from the Gravelotte area to their new home on the back of flatbed trailers. Up until and including Friday, ERP paid for unlimited flying time to keep an eye on the elephants’ movements so they could be chased back to a safer area should they wander into local villages or onto properties where the owners had threatened to shoot them. Balule Nature Reserve agreed to take ownership of the animals, with ERP fitting the bill for all capture, helicopter, and veterinary costs, which summed well over R300,000. Kester Vickery, an elephant relocation specialist, was also flown in from KZN to assist. The flatbed trailers arrived on Friday afternoon, but the team decided not to take the risk of starting the operation with the daylight hours fading. According to Milburn, the team checked the weather report and decided the impending thunderstorm forecast for Saturday would bring enough relief for them to carry out the procedure. The storm never came, and Saturday’s temperatures soared to unimaginable heights. Her comments were echoed by other personnel involved in the process. “It was D-Day, if we didn’t try to catch them then, they were dead. It was a case of get hot, or get shot. It was a mercy mission,” said another person involved with the procedure. The team took to the skies at first light on Saturday to locate the animals and by 8am, their location was determined and the process began. However, the temperatures rose rapidly, and by the time all four animals were darted, temperatures were in excess of 40 degrees. One elephant sadly passed away en-route to Balule, another died upon arrival, and the last two died once they were given the reversal drug. “They were just too weak to stand,” said Meyer. The heat of the day proved too much and the animals succumbed to the temperatures, unable to regulate their own body temperatures effectively while under the anaesthetic. “I didn’t even want to get up this morning, I am devastated,” Milburn told the Letaba Herald on Monday. LEDET’s spokesperson Burkels Napo was contacted for comment, but at the time of publicaation, no response was received.